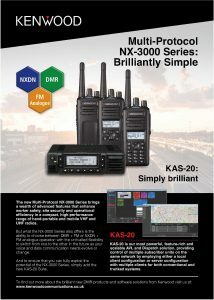 An advertisement to launch the remarkable, feature-rich Kenwood NX-3000 Series, multi-protocol two-way radios and the KAS-20 AVL and Dispatch software suite. Both set to revolutionise the market with future-proof voice and data communications for professional users. And both representing exceptional value in this price sensitive market.